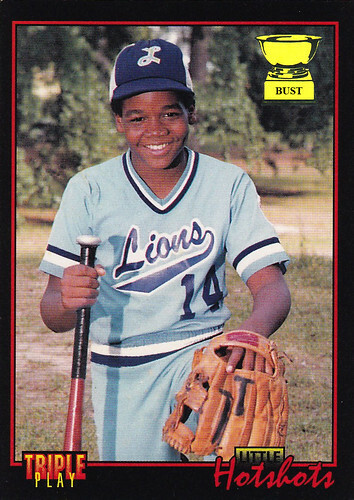 Lions' scouting report on 10-year-old Frank Thomas: "Good kid with a great smile, but he has a vicious Twizzlers addiction. ... Has the heart of a Lion, which, technically, is true of all our kids. ... We can see him using a smaller glove when he's a 6-foot-5 big league first baseman in 15 years. ... Must-have skill: looks great in mesh. ... Easily the cutest kid in his class, which can be more important than baseball skills. ... Looking at dimples, he should end up a lady killer. ... If we're to believe this photo, he has experience playing ball in the middle of a forest. ... Got a VG+ in cursive handwriting, according to Ms. Coverdale. Impressive. ... Ownership needs to take into account that he can't play night games, given 'supper time.' ... Little Lizzy Vignola passed us a note saying she has a crush on him. This could prove to be a distraction. ... Even at age 10 has more power than Ron Karkovice."